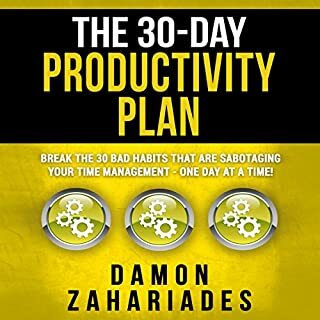 In this new audiobook, Time Management: Perfecting the Lifestyle Called Punctuality, you will learn some of the reasons why we are often late, how to effectively deal with the problem, and plenty of advice and strategy to cut down on the instances of it. Do you want to build your personal brand as a coach, consultant, author, creative artist, small business owner, or entrepreneur? Based on his own success as an Inc. 500 entrepreneur, New York Times best-selling author, and global speaker, Kevin Kruse will teach you how. These days, we face no greater challenge in our personal and professional lives than organizing and managing our time. Now Julie Morgenstern explains how to overcome the time challenge once and for all. Her groundbreaking from-the-inside-out approach helps you uncover your psychological strengths and stumbling blocks and create a time-management system that suits your individual needs. loved it.. Don't think just BUY IT! This was an excellent book, read by an author whose voice struck the perfect balance between a supportive friend and a coach. While much of the content of professional development and self-help books is intuitive and already known by the reader, it is often not implemented by the reader or needs to be spelled out a different way. Kruse highlights some terrific points I will no doubt try to implement with the start of 2016. At first I was put off by the repeated reference to his website. However, I was wrong to get annoyed. The repeated emphasis enabled me to recall the master your minutes web address and visit the website when I awoke at 4 am. Then I saw that the pdf tool/resource was a great takeaway souvenir. The delivery of the audiobook was masterful. I was able to fire off at least 2 dozen of Kruse's points and capture them on paper. Clearly the points in the book resonated. I am committed to implementing and sharing, so they will no longer be secrets. I've read many time management books, and the best tips from each are condensed into this book. There's also some new tips in this one that are completely original. 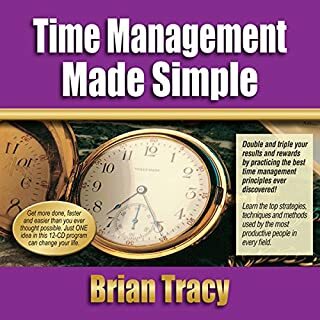 This truly is the only time management book you'll need without wasting time on the other books. If you really follow the strategies in this book, you Will master your time! I have only implemented some of the points brought up in this book for the past 3 days. I already feel way more productive and have implemented the scheduling system with my subordinates already. 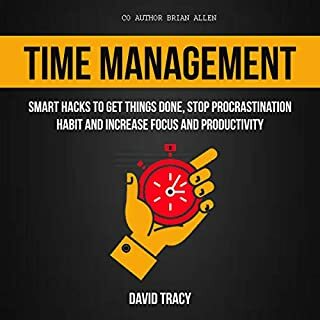 It's an awesome book that I was already picking up tips and tricks to better manage my time as well as my life within 20 minutes, but it looks like the writer is so into time management that he narrated the book so fast. Thankfully, he already put up a pdf with summary and infographics for almost everything in the book. easy to listen to. I wish there was more illustrative focus on examples, implementation, and how to vs 5 ideas for 5 people at the closing of each chapter. good content, now I need to get another book on applying these. Great advice for getting your life together! I wanted to rearange my schedule ever since I noticed I was running late and falling behind on assignments, this so far had help immensely. The key goal is to take the advice, plan a schedule thats works for you, and most importantly - stick to it! Do make sure to plan a schedule that is best to your needs, the type of person you, and dont be afraid to rearrange it until you achieve something that gives you maximum efficiency with reasonable brakes. 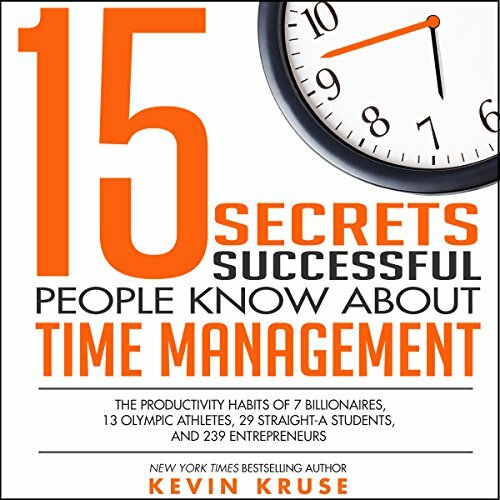 Where does 15 Secrets Successful People Know About Time Management rank among all the audiobooks you’ve listened to so far? What was one of the most memorable moments of 15 Secrets Successful People Know About Time Management? Have you listened to any of Kevin Kruse’s other performances before? How does this one compare? You will change somethings in your day guaranteed. There is something for everyone in this book. I am going to use it with my supervisors and professional staff. This book is by far the most inspirational book I've come across ... ever! Not normally one to write a review but I had to with this! Things I love about it ... it's to the point, gives you so many real life examples that are achievable and can be put into practise straight away. Bottom line is - this guy knows what he's talking about and conveys this in a simple way that one can easily relate to. Highly recommend - I have already started being so much more productive at work and feeling less stressed and more on top of things! Very actionable and life changing - plenty of examples to relate to, internalise and act on. Highly recommended. 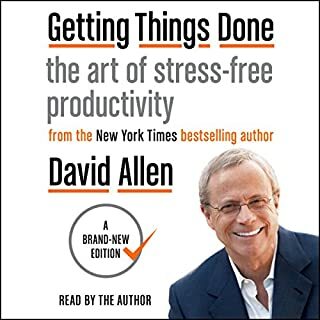 I have read/listened to several time management and productivity books and this ranks amongst one of the best. Of particular interest are chapters 4 (calendar blocking), 8 (email), 13 (themed days & regular time-slotting) & 15 (morning rituals) ((on the audio version)) although it's well worth listening to the whole thing. I have found myself in a bit of a slump in terms of keeping myself motivated and being efficient with my time. wondering what other folks do. this boom is a good collection of habits that I will try to adopt. really disappointed the free material doesn't exist on the site mentioned over and over. 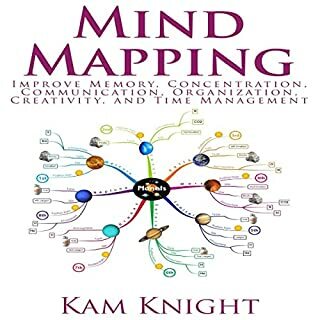 This book has sonething for everyone to relate to and change the way they manage time. I am now using some of the principles from this book. It's removed my to do list and a lot of stress. The best business book I have read so far! This is my first ever review and I have listened to a few business books to date but I found this one the best by far. It summarises some things I heave heard in others but it gives more and the layout and approach to this book is simple and straight forward and more impotently straight to the point. I found it very easy to follow and can tell it will make a big difference in my self employed work life! This is a perfect book for any entrepreneur and not only. 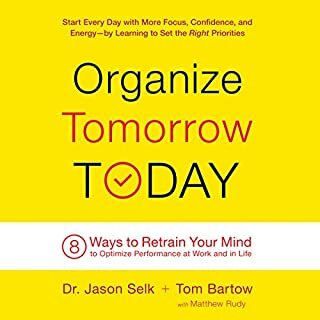 I wish I read it earlier, it already helped so much with dealing with the stress caused lack of time and overwhelming to do list. Loved every chapter of this book!! I usually struggle to see books through to the end, but this book was a definite exception. Not only was all of the information relevant, it was really practical in the sense that it applied to any audience and was easy and clear to understand. Lots of key points relating to many different people. Thanks for writing this audio book. I look forward to more practical tips and suggestions that can be easily implemented in our world of work. Thank you.